I am usually pretty skeptical of ‘with strings’ type acts. Obviously the model is Charlie Parker’s “With Strings” album, an album I have always strongly disliked. I don’t think Bird really needed the saccharine, overly lush arrangements behind him. Really, my problem isn’t with the strings, but how they’re used. On “With Strings”, the strings are a bit of tacked on arrangement that don’t really interact with the music meaningfully. On, say, Michael Brecker’s “Wide Angles”, however, I think the strings are used really well. The strings are an integral part of the band, filling out the rhythm section in the absence of a piano. Chris Potter’s “Song For Anyone” works the same way. And what’s really great is that the strings actually take solos there! Marc Feldman is a supremely talented violinist; I love his work on both Potter and Brecker’s albums as well as in John Zorn’s Bar Kokhba band and on in his own. I have a special appreciation for Tom Harrell. In particular, I have found the last three quintet albums (with Wayne Escoffery on saxophone, Danny Grissett on piano and Rhodes, Ugonna Okegwo on bass and Jonathan Blake on drums) consistently satisfying. 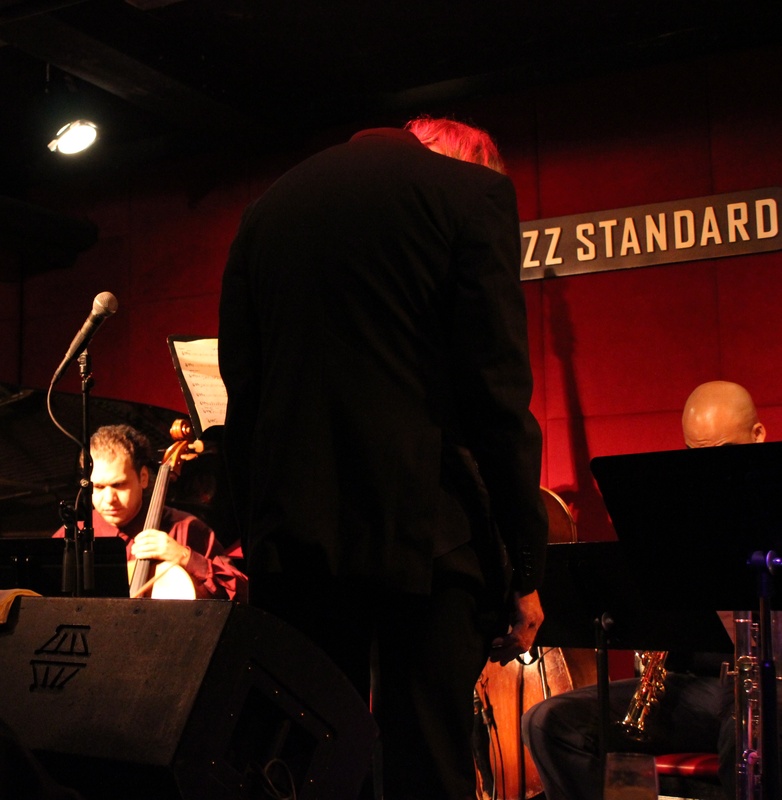 Last night at the Jazz Standard, this quintet was expanded into the Tom Harrell Chamber Ensemble with violin, cello and flute, and despite my misgivings about such groups in general, I decided to not pass up an opportunity to see Tom live. Happily, while I may actually have preferred to see him with just the quintet, it was a great show. More after the break. The Jazz Standard schedule pamphlet explains that the Chamber Ensemble “[celebrates] the special affinity between jazz music and the works of Debussy and Ravel.” That’s an interesting idea. Impressionist music, particularly through musicians like Bill Evans, has had a not-insignificant effect on jazz harmony. The connection between the two types of music is clear; the works of Debussy and Ravel are sometimes even directly adapted into jazz tunes (as on Sonny Rollins’ album “Tenor Madness”). That having been said, there are potential pitfalls in taking an approach like the one Tom has taken here, though he mostly (but not quite) avoids them. Tom avoided talking as much as possible, besides introducing the members of the band, so none of the songs were introduced, thus I can’t really give you a setlist. The only title I caught (because I could see it on the top of the lead sheet on Tom’s music stand) was ‘Reverie’ (or at least, I think that’s what it said, it was sort of far away), hence the name of this post. I don’t know if Tom has played with with this expanded group before or how long they’ve been working on the material. The opening of the first song they played seemed a bit messy, so perhaps not long. By the end of the song they had tightened up and remained pretty tight throughout. My biggest complaint with the ‘with strings’ type project is the lack of interaction between the strings and the jazz. This project kind of suffered from that, though kind of did not. Each song (except for one duet, discussed in a bit) was bookended with a through composed section highlighting the strings. In the middle, there was a usually more upbeat section for improvisation. These middle sections sounded largely like any other jazz song you might hear. Unfortunately, with the exception of one violin cadenza (discussed more in a bit) the strings did not solo, although the strings did add backing figures behind the soloists which had a nice feel. As a format, there were pros and cons. Generally I think it sounded pretty good, but sometimes I felt it was a bit constraining. Tom Harrell is the sort of player who won’t play a single note if he isn’t absolutely sure he wants to. If he doesn’t think he has the right phrase to put in the moment, he’ll wait for the right time to come. In other settings, this is a blessing, but unfortunately most of the arrangements suffered from ‘big band syndrome’ where each solo is very short, lest the solos take up too much time away from the arrangements. If there’s only one chorus for a trumpet solo, you can’t wait to find the best place to start. If you wait too long, the solo is over before you’ve begun. On the second song, Wayne jumped right into his solo, which was spectacular, but Tom hardly had a chance to play anything at all. He paused, played a note, decided to switch instruments, paused again and then realized there wasn’t quite enough time left to get in a full solo. It would have been great if he had a bit more time to stretch out. When he does play, however, his playing is a real joy to hear. He has such a great tone, particularly on flugelhorn, which he played on most songs. There were two real standout cuts of the evening. The fourth song was a duet between Tom and Danny Grissett on piano. It, more than anything else in the set list, sounded like a transcription of a piece of classical music (although, I couldn’t name it for you) with following improvisations. Danny’s solo had a great, natural feel to it, working the impressionist harmonic language into the jazz feel effortlessly. Tom’s solo followed and was the model of what should normally happen in a solo that isn’t too time constrained. Immediately following that, the rest of the band came in again for the best cut of the evening. The opening through-composed section highlighting the strings and woodwinds was great. Jonathan Blake’s drum solo which bridged the through composed section with the improvised section worked so well with the song; he kept his touch light and kept the mood of the song moving forward. Next, a rollicking piano solo with moody string backing figures. Immediately as the piano wound down, Tom jumped in with his most proactive and exciting solo of the evening, a real joy, and it really showed off his not unimpressive chops. A sax solo with solo (sans rhythm section) cadenza followed, then a bit of the original composed section followed by the only string solo of the evening: a sometimes kind of scratchy sounding violin cadenza. I guess I shouldn’t be disappointed that the strings and flute player, who likely aren’t trained as jazz musicians, didn’t do much improvising, but it does seem like something of a wasted opportunity to write for an ensemble like this and not have more space for them to stretch out in a more traditional solo-with-rhythm-section setting. Harrell consistently comes through with albums that are interesting yet accessible and swing. Maybe I like him better when he has more room to stretch out, but it was a great set either way. I’ve enjoyed every show I’ve been to recently, hopefully I’ll see something bad in the near future so I can write something other than how much I enjoy what I’m hearing.